Camping, Motorhome and Caravan site in a 12 acre landscaped area adjacent to our local Nature Reserve, Weston-super-Mare beach is 5 minutes walk away with local inns 3 minutes. 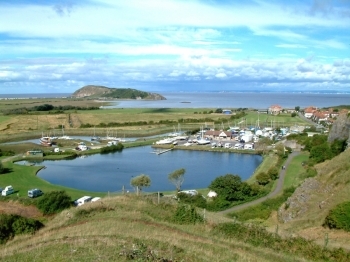 The Mendip Trail starts here with access to the Brean Down peninsular and Fort. Marine Lake is available for water sports, Marine Activity events and pontoons for mooring craft as weekend and holiday accommodation. Tidal moorings and pontoons also on site. Wharfside Tearooms on site, now open for Boaters breakfast, lunches and cream teas. Local bus services stop by our entrance with Weston Town and Pier some 10 minutes ride. The local cliffs provide climbing activities and also keep out all traffic noise and ensure that you wake up to the Dawn chorus. We have some pitches on hard standing for Winter use with power sockets close by. All power cables are have now been laid for the 2012 season in additional site areas. Electric hookups now included in site charges.Additional toilet block now available and extra showers now also in use.